A simple selfie by Roger Federer, the world number two men’s singles tennis player and 2018 Mastercard Hopman Cup winner, has attracted the world’s eyes to WA. The Swiss tennis star flew to Rottnest Island by helicopter on December 28 on a promotional visit for Tourism WA, one of the tournament’s sponsors. He explored Parakeet Bay, before heading inland to find a quokka to achieve his ‘bucket list’ goal of mingling with the marsupial. 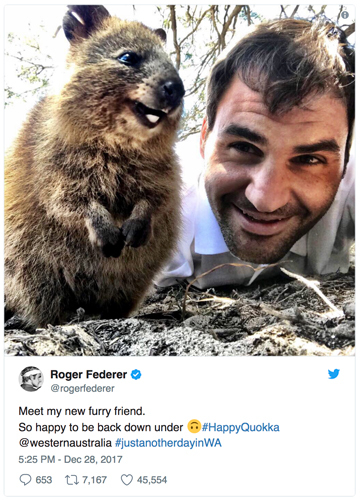 He subsequently posted a shot on his Instagram account with the message ‘nice to meet you’, and referenced his furry friend with the hashtags #newpal, #westernaustralia, #rottnestisland, and #happyquokka. His Instagram post attracted 525,000 likes, 5,000 comments and was shared 2,500 times, reaching 5.3 million people across Facebook and Twitter – a personal Instagram record for the sporting superstar. It also made headlines in newspapers and on news websites around the world, appearing in 239 publications in the United Kingdom, 53 in Switzerland, 45 in Colombia, 30 in the United States and 41 across Australia, with the post reported on in 13 different languages. Media monitoring agency Meltwater calculated that the selfie had generated 619 online news articles in 45 countries that had been viewed 581 million times.